They are used to apply veneer or laminate to 2 or 3 dimensional products or bond two materials together. The vacuum system removes entrapped air instead of compressing it, ensuring that no air will reappear in the course of the product’s life. The lack of air combined with high pressure ensures an air-tight seal, easily bonding materials together. Vacuum presses are used in the furniture, construction, electronic and medical industries, and are generally found in workshops or industrial manufacturing facilities. They may be small and portable, but most of the time they are large, heavy equipment that stand alone or are part of an inline conveyor system. Vacuum Presses – Grimco Presses Inc. Kitchen cabinets, doors and office furniture are often made of particle board, which are compressed wood ships and shavings that have a wood-like veneer that is applied to the exterior by a vacuum press as an alternative to real wood furniture. 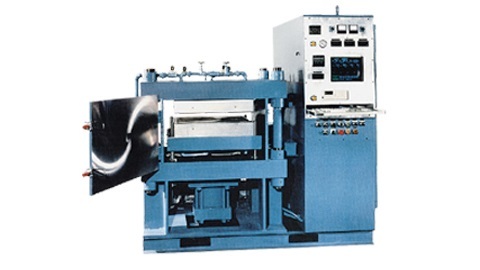 Vacuum presses are also used to bond aluminum sheets and foam insulation, apply plastic laminate to countertops and tabletops, produce musical instrument parts, prosthetics, silicone heaters, solar panels, electronic materials, printed circuit boards, decorative laminates and honeycomb panels used in building construction. Vacuum presses are made of a welded leak-free vacuum chamber that allows lamination at lower pressures, which, in some cases improves the quality of the products. Each lamination run takes approximately 5 to 7 minutes, but multiple products are able to be formed at once. The vacuum press easily and completely removes trapped air and volatiles, and is able to achieve high psi ratings. The vacuum level is controlled by a vacuum gauge or vacuum transducer, and is often turn-key operated. Small, portable vacuum presses are most likely found in small workshops, while large industrial vacuum presses are integrated into facility systems and include conveyors, loading and unloading systems, and heating and cooling systems. They are part of a continuous process and are often CNC operated meaning that they are fully automated, which nearly eliminates the need for human workers. The advantage of CNC vacuum presses is that they are able to collect and store data, archive and keep track of information. The press is heated by thermal fluid running through the system. All vacuum presses must be Occupational Safety and Health Administration (OSHA) compliant in addition to adhering to strict safety and quality regulations established by various other organizations. Vacuum Presses Vacuum presses are hydraulically powered industrial systems that use air pressure to provide necessary force and air removal needed for laminating applications.